It’s been a whirlwind of accomplishments the last 12 months in Colorado golf — to the point that it virtually blows people away, at least the types who are longtime observers of the game in the state. Colorado and its golfers certainly have a rich history in the sport. But the national and international achievements over the last year — especially in competition — set themselves apart as one of the best such periods in Colorado golf history. CSU’s Katrina Prendergast and Ellen Secor with their U.S. Women’s Amateur Four-Ball trophy. — May 2, 2018: CSU Golfers Win U.S. Women’s Amateur Four-Ball Title. 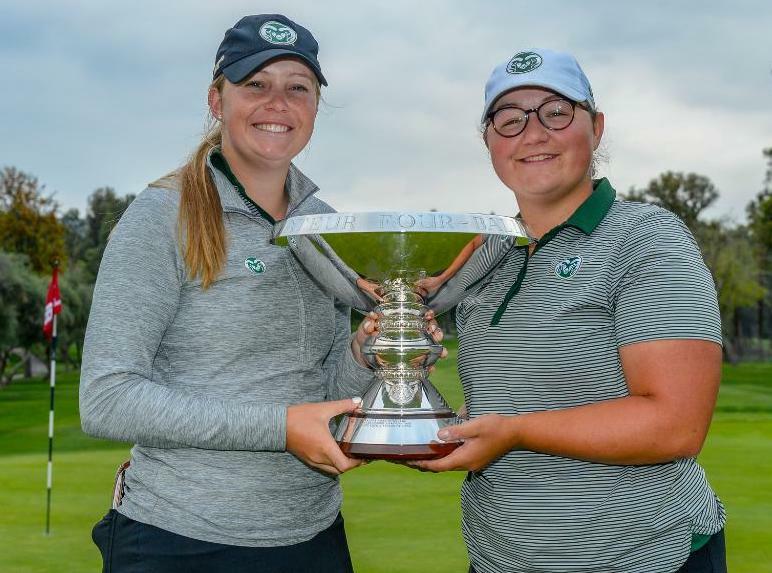 Golfers with strong Colorado ties don’t often get to say they’re reigning USGA national champions, but Colorado State University golfers Katrina Prendergast and Ellen Secor earned that honor by winning the U.S. Amateur Four-Ball title in Tarzana, Calif. The two never trailed in the first four matches they played at El Caballero Country Club. In the title match, they were 2 down with four holes left, but a big-time rally down the stretch netted them a 1-up victory over teenagers Yachun Chang of Chinese Taipei and Lei Ye of China — and the national championship. The victory was believed to be the first USGA national amateur championship by a person or team with strong Colorado ties since Jill McGill won the 1993 U.S. Women’s Amateur and 1994 U.S. Women’s Amateur Public Links. — May 21, 2018: Kupcho Captures Women’s NCAA Division I Individual Championship. The Wake Forest golfer became the first Colorado resident to win this prestigious individual national championship on the women’s side. Making it all the sweeter was that she did so a year after she held a two-stroke lead with two holes left to play at the NCAA finals, but made a triple bogey and finished runner-up. 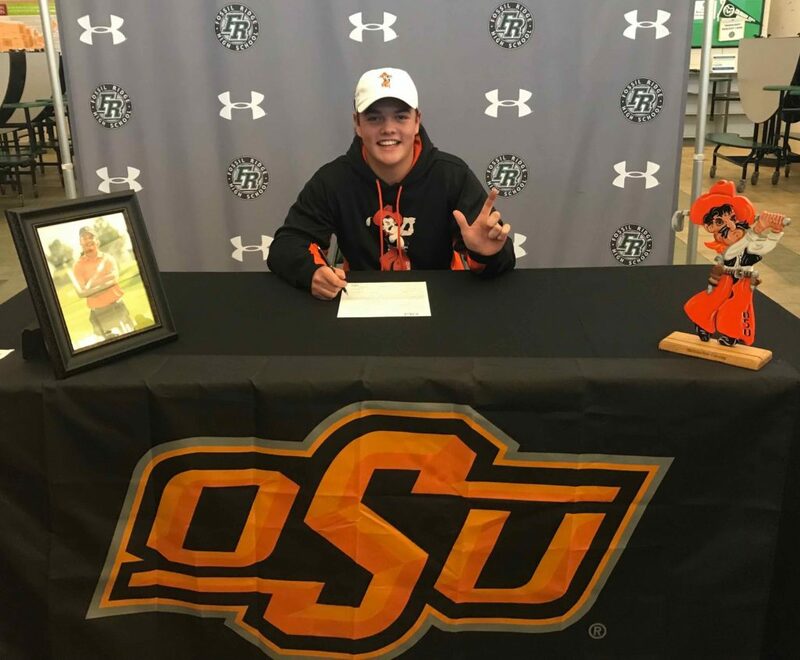 This time, a week after turning 21 Kupcho drained a big-breaking 50-foot birdie putt on the 16th hole of the final round in Stillwater, Okla., and went on to win by two strokes. — Late June, Early July, 2018: U.S. Senior Open a Hit at The Broadmoor. It had been almost four years since Colorado had hosted a big-time tour-level event — the kind that attracts 100,000-plus fans. But the drought ended last year when the U.S. Senior Open was conducted at The Broadmoor in Colorado Springs. And the results didn’t disappoint. The announced attendance for the week was 134,500, the most for the Senior Open since the 157,126 in Omaha, Neb., in 2013. David Toms, who won the 1999 Sprint International at Castle Pines but hadn’t captured a title on the PGA Tour or PGA Tour Champions in seven years, captured the victory at the Senior Open by one stroke. Colorado Golf Hall of Famer Brandt Jobe placed fifth, marking his second straight top-5 performance in the U.S. Senior Open. — July 2018: Kupcho No. 1 Women’s Amateur in the World. Kupcho reached the No. 1 spot in the Women’s World Amateur Golf Rankings in July, the same week she posted her best finish ever in an LPGA Tour event, placing 16th in the Marathon Classic. When this week’s rankings come out, Kupcho will be No. 1 among women’s amateurs for 28 weeks. Because Kupcho was No. 1 as of the conclusion of the 2018 U.S. Women’s Amateur in mid-August, she won the Mark. H. McCormack Medal, becoming the first American woman to earn that honor. — July 26, 2018: Colorado Team a Junior America’s Cup Champion for First Time. In Montana, a Colorado team made history at the boys Junior America’s Cup, a competition which features many of the top junior golfers from the western U.S., Canada and Mexico. For the first time in the 44 years in which Colorado has competed in the event, its squad claimed the team title. In fact, a Colorado team had never finished better than third in the event before 2018. To add to the feat, Dillon Stewart of Fort Collins won the individual title out of the 72-player field. Joining Stewart on the winning team were Cal McCoy of Highlands Ranch, Davis Bryant of Aurora and Walker Franklin of Broomfield. Former longtime CGA staffer Dustin Jensen captained the Colorado squad. — June to Sept. 1, 2018: Kupcho on 3 Winning U.S. Teams in 2018. Besides what Kupcho accomplished on an individual basis in 2018, she played on three U.S. national teams — all of which won titles in prestigious international competitions. She went 3-1-1 individually as the Americans routed Great Britain & Ireland 17-3 in June at the Curtis Cup. In July at the Arnold Palmer Cup in France, Kupcho was 3-1 as the U.S. prevailed 38.5-21.5 over an international squad of collegians. Then on Sept. 1 in Ireland, Kupcho finished second individually out of 170 players, helping the Americans win the Women’s World Amateur Team Championship for the first time in 20 years. — Summer and Fall, 2018: 4 Coloradans Earn PGA/LPGA Tour Cards: Seldom have players who grew up in Colorado enjoyed so much success in qualifying for the top men’s and women’s golf tours in the world as they did in the final half of 2018. Wyndham Clark and Jim Knous earned promotions to the PGA Tour with their performances on the Web.com Tour regular season and Finals, respectively. And Kupcho and Becca Huffer landed spots on the LPGA Tour in 2019 by both finishing in the top 10 in the eight-round LPGA Q-Series, with Kupcho placing second and Huffer 10th. All four Coloradans will be/are rookies on those top circuits in 2019. Though Kupcho won’t begin her LPGA career until the late spring — after completing her college days — and Huffer has missed the cut in her first four LPGA events, Clark and Knous have enjoyed some success on the PGA Tour. Knous finished 10th in his season debut (the Safeway Open), later scored a hole-in-one at another event and has been in the money in seven of 13 tournaments. This season, Clark has posted top-10s at the Puerto Rico Open and the Honda Classic, four top-20s overall, and has made 11 cuts in 14 events. Dillon Stewart of Fort Collins making his college plans final. — November 14, 2018: Stewart Signs With No. 1-Ranked College Team in Nation. It’s not often that a Colorado golfer signs a national letter of intent with the No. 1-ranked college program in the nation. But such was the case when Dillon Stewart of Fort Collins put his John Hancock on the dotted line with Oklahoma State. Stewart, who has since graduated from Fossil Ridge High School, will be headed to Stillwater for the fall semester. Stewart was the Junior Golf Alliance of Colorado’s Boys Player of the Year for 2018. — July 1, 2018 to Feb. 21, 2019: 3 More USGA Events Planned for Colorado. In the course of less than eight months, the USGA announced that three more of its national/international championships are coming to Colorado. There will be the 2020 U.S. Girls’ Junior at Eisenhower Golf Club at the Air Force Academy; the 2023 U.S. Amateur at Cherry Hills Country Club; and the 2025 U.S. Senior Open returning to The Broadmoor in Colorado Springs. Another USGA championship, this September’s U.S. Mid-Amateur at Colorado Golf Club, had been perviously announced. Last September, yet another notable event, the Web.com Tour’s TPC Colorado Championship at Heron Lakes in Berthoud, was formally put in the books annually from 2019 through ’23, with the inaugural one set for July 11-14 of this year. — April 6, 2019: Kupcho Makes History at Augusta National. Kupcho originally was planning to turn down an invitation to the inaugural Augusta National Women’s Amateur — the first big women’s championship ever conducted at the home of the Masters. But after Wake Forest’s spring schedule was tweaked a little, Kupcho opted in, and the rest is history. The Westminster resident overcame a migraine headache in the middle of the final round and played her final six holes in 5 under par to win the first ANWA by four strokes. The victory led to a blitz of media appearances over the coming days — on Golf Channel, NBC’s Today Show and The Tonight Show Starring Jimmy Fallon (pictured at top with ANWA runner-up Maria Fassi), among others. That’s one wild and eventful ride for Colorado golf over the last year. And who knows where it goes from here?